With a red sole and sky-high heels, these shoes could easily be mistaken for a pair of Christian Louboutins. 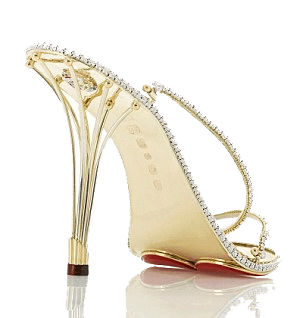 But with a £100,000 price tag, the Eternal Diamond stiletto – made entirely from gold and diamonds – makes most luxury brands look High Street. Created by bespoke jewelers House of Borgezie, the world’s first designs have already created a stir among celebrities. And athough the clientele is strictly confidential until pieces have been completed, we can reveal they include – surprise, surprise – A-listers from the world of football, music and modelling. Venturing a guess on who has placed orders would likely lead to Cheryl Cole, Victoria Beckham and Paris Hilton, whose excessive tastes are funded by a bank balance to match. 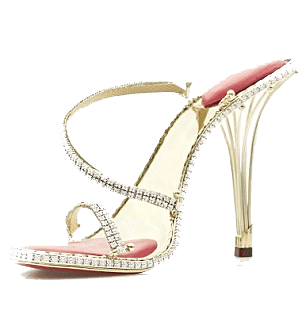 Made by British jewellery designer Christopher Michael Shellis, each pair is handcrafted from solid gold and then encrusted with 2,200 brilliant cut diamonds, totalling 30 carats. Shellis has spent three years working on the creation, perfect for summer balls, society weddings and red carpet events.